Boxing is a fun and challenging combat sport. Even though the fighting style of boxing focuses on striking with just your two hands, mastering it requires more than simply being able to punch hard. An individual’s punching skills must be supported by their proficiency in head movement, footwork, timing and ability to attack at different angles. This article describes 7 of the best training tools for improving these specific skills. The heavy bag is a mainstay in every boxer’s training regimen and is terrific for developing power behind your punches. There are multiple ways to set up this equipment. Whether using an attachment composing of straps or chains, a heavy bag could be hung up on a heavy bag stand or from the ceiling. To maximize the longevity of the equipment, choose the metal chain option. 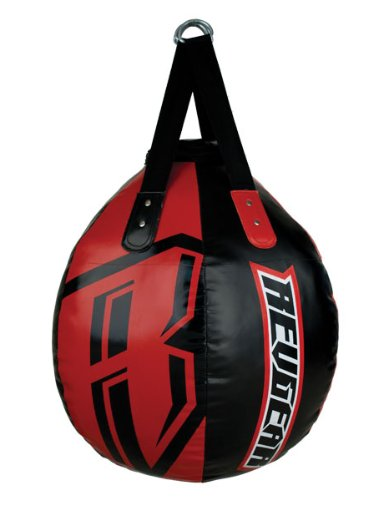 The Ringside heavy bag shown above comes with a heavy bag chain and a swivel. If you are planning to mount the heavy bag from the ceiling, then it is recommended that a h﻿﻿eavy duty spring is purchased with it as well. This spring will help reduce the noise, vibration and damage inflicted on the ceiling mount. The Ringside bag also has a D-ring on the bottom of the bag to anchor it and limit the bag’s swinging motion. 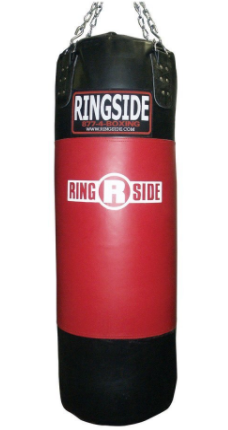 This traditional heavy bag from Ringside is available in four different weights and their 200 lb. option is a fantastic choice for heavyweights and hard-punching boxers. The wrecking ball, also known as the body snatcher bag, is a wonderful alternative to the standard heavy bag. It allows you to perform the same punching combinations and movements while its round surface grants you the ability to punch at angles not available with the traditional bag. The best part of the wrecking ball is the ability to integrate realistic uppercuts into your combinations and the feedback this bag gives you as a result. Not only are you able to develop the ability to dig hard uppercuts to the body, you can also practice infighting techniques with it. Wrecking balls are not normally anchor to the ground and its low weight relative to the traditional heavy bag means that it will swing to a greater extent, therefore forcing you to be more active in your movement and angle of approach. Furthermore, you can include ducking and weaving movements underneath the wrecking ball as part of your training. The Revgear wrecking ball has a synthetic leather outer shell with a distinguishing physical appearance. It is delivered pre-filled and should weigh approximately 60 lbs. Four heavy duty nylon straps are attached to the wrecking ball and there are two metal D-rings for connecting it to a heavy bag chain. 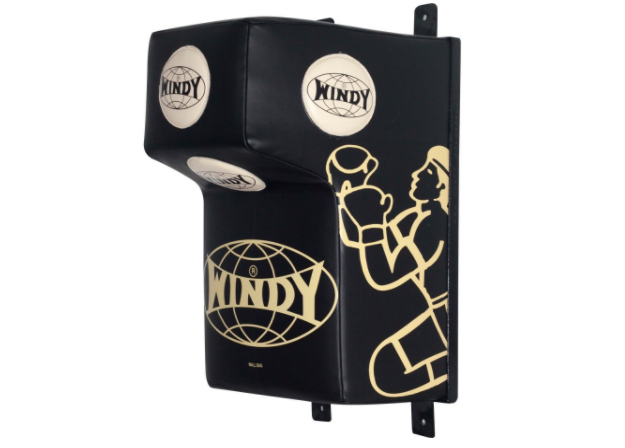 A wall mounted pad is one of the best tool for practicing hooks and uppercuts. The top portion of this wall pad has extended padding to mimic an opponent’s head. This stationary target allows you to throw combinations at angles that are more realistic than hitting the traditional heavy bag. Moreover, it is an awesome choice for practicing infighting with short shots and being able to lean on the wall pad as you would with an opponent. It is important to wear hand wraps when punching wall pads, since they are mounted to the wall and do not give and swing away like a heavy bag. The Windy wall mount pad system is one of the best looking and high quality pads available on the market. Their wall pad is handmade in Thailand and uses genuine leather construction for supreme durability. 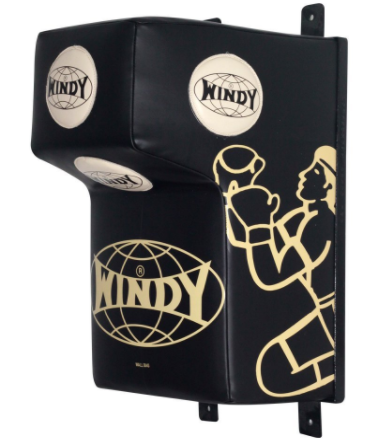 Windy’s wall pad has dense foam padding with specifically placed targets for individuals to improve their accuracy. Behind the Windy wall pad is a structure for mounting it securely to the desired location. It is easy to install the wall pad, but you need to make sure you have a sturdy support structure or wall for it to be mounted on. The only downside to this Windy wall pad is its price. If this item is outside your budget range, then try checking out the more inexpensive options from Twins Special and Title. Double-end heavy bags are uniquely shaped bags that blend characteristics from the previous three equipment. It forces you to work on your accuracy and be careful about how you position your hand each time you punch. The double-end heavy bag does not provide as much resistance as a heavy bag due to its weight, so it is not suppose to develop your punching power. However, a double-end heavy bag has a firm structure and its curvature is tremendous for sharpening your uppercuts. In addition to that, its design also enhances your ability to throw head and body shots. A well built and good looking double-end bag can be purchase from Combat Sports. The outer shell of the Combat Sports bag is constructed with a durable synthetic leather material. Its midsection has a diamond stitching pattern that boosts its overall physical appearance. The top portion of the Combat Sports bag has four nylon straps stitched onto it, while the bag’s bottom portion has a metal loop for anchoring and limiting its swinging motion. Combat Sports does not provide a mount and anchor kit, so you will need to buy the heavy bag chain and anchor cord separately. Double end bags forces you to improve your rhythm and accuracy. It is also excellent for building hand speed. The double end bag is one of the most difficult equipment for boxers to master. The difficulty arise from needing to time your punching at the right time, angle and location to keep it moving at the desired rhythm. The size of the bag is a big factor in your skill development. Smaller double end bags require greater precision and should be left for the more experienced boxers. As you become competent at hitting the double end bag, try incorporating head movement drills and manipulating its speed to challenge yourself. The Title Classic double end bag has a synthetic leather exterior and a butyl rubber bladder on the inside. It can be tricky to setup the double end bag and have it move with the right feedback instead of wobbling in an undesirable behavior. To do so, the double end bag needs the right amount of inflation and tension on the cords connected to it. Title conveniently provides a pair of hanging cords to go with their double end bag. Each end of these rubber hanging cords has a metal clip attached to it. Title does not offer a ceiling mount, a floor anchor or an air pump though. 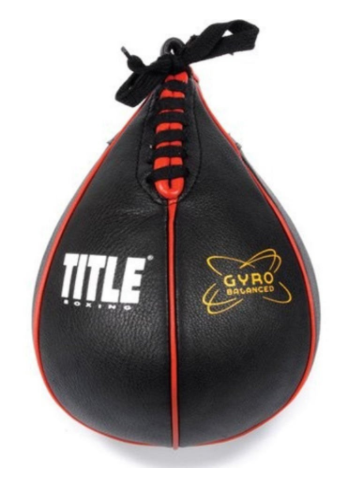 This Title double end bag’s size is ideal for beginner and intermediate level boxers. Speed bags are essential boxing equipment for improving muscle endurance, hand-eye coordination, timing and rhythm. It is also great for developing the habit of constantly keeping your hands up, which translate well to the sparring component of boxing. Training on a speed bag can be frustrating in the beginning, so you need to stay committed to it and work on hitting it at a slow pace before pushing yourself any further. Just like the double end bag previously mentioned, it is important to choose the larger sized speed bags when you first start out. Experienced boxers can work on speeding up their pace and choosing the slimmer bags as they progress. In addition to that, you can incorporate bouncing on your tippy toes as you hit the speed bag to make it more challenging and add an extra aerobic component as well. The Title speed bag is available in four different sizes to accommodate for boxers with different experience levels. It has a durable leather exterior with a butyl rubber bladder interior. Title also reinforced the bag’s seams to obtain a high quality construction. To properly use this speed bag, you need to purchase a speed bag platform and an air pump as well. Practicing with a maize ball is excellent for improving your defense and counter striking skills. Unlike the other items listed in this article, the maize ball is not designed to be punched and doing so will ruin the Maize ball quickly. The maize ball is simply an item that should be swinging back and forth from a ceiling or tall structure. It is used for head movement drills like slipping and rolling underneath. The maize ball helps individuals develop a good habit of keeping your head off the centerline as you throw punches. Furthermore, advanced strikers should use it as an opportunity to incorporate footwork and move in and out at various angles as well. Training with the Maize ball will also force you to have constant head movement and be able to change your rhythm as the swinging distance shortens over time. 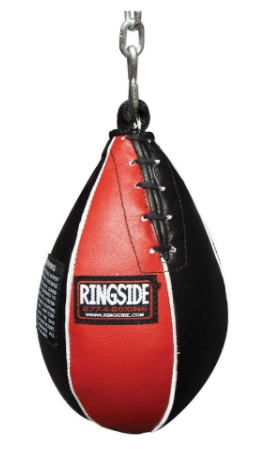 Ringside offers an inexpensive maize ball that is pre-filled and has an outer shell made out of vinyl synthetic leather. The installation for the maize ball is relatively easy. The Ringside maize ball comes with a chain for hanging it up, so you will only need a ceiling mount piece to complete the process.